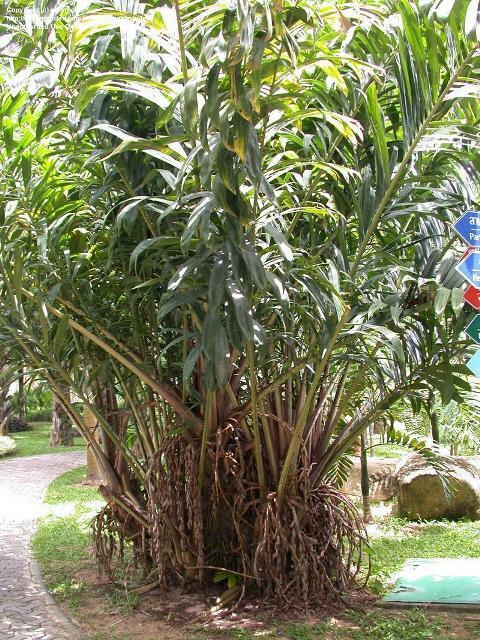 RAKUM PALM is found in Myanmar, Thailand and Malaysia. It can be seen be seen wild in the forests as well as cultivated in private and public lands. This fruit, however, seems to be more popular in Thailand. Here the fruits are mostly from wild growing plants most of which are not of a superior quality. The fruits are sold and consumed locally, mainly fresh. The area planted with the with the inferior rakum forms has never been recorded. This fruit seems to be a native of South East Asia. A dioecious, creeping and tillering palm reaching upto 3-4 m high with msny adventitious roots which can be as long as 2 m.
Leaves 3-7 m long, pinnate; spines flat, linear-triangular, almost perpendicular to the leaf-sheaths, some pointing downwards; leaflets 60-75 cm x 6-8cm. Male inflorescences about 1m long, branching into many reddish spadices; flowers with 3 sepals, 3 petals and 5 stamens; anthers with functional yellowish pollen; female inflorescences 1-2 m long, with 3-8 reddish spadices, each with staminate and hermaphrodite flowers in 1:1 ratio, both without functional pollen; staminate flowers with a reddish, tubular corolla and 5 staminodes borne on the corolla throat; hermaphrodite flowers with 3 pink sepals, fused at the base, ovary trilocular, hairy, with a short, trifid dark red stigma, staminodes 5-6, borne on the corolla throat. Fruit a drupe, occurring in dense heads, obovoid, 2.5 cm long, the skin (epicarp) consisting of orange-brown scales with reflexed brittle points; endocarp not differentiated. Seeds 1-3, covered with a fleshy sarcotesta which constitutes the edible portion. The fruits from different trees vary a lot in colour (pale yellow to pink and dark brown), taste, texture and thickness of pulp. Rakum palm does best in the hot low lands having an annual rainfall of 2500-3000 mm with 5-6 dry months. Dry weather is needed for good fruit set. spadices emerging in the rainy season tend to rot and the viability of the pollen is poor. The optimum temperature range seems to be 22-32 C. Temperatures lower than these, tend to lower reduce flowering. The palm thrives in soils ranging from sandy loam to heavy clay. On low-laying wetlands it can stand drought very well, but in the dry season irrigation is needed for a good yield. In its natural habitat and in mixed orchards rakum is commonly found under shade. In commercial orchards the palms can be grown successfully without shade, provided they are irrigated. Propagation is mostly by seed, though vegetative propagation is certainly a better option. Fresh seeds have a germination rate upto 90% and emerge in less than 10 days, but the rate decreases after storage. For vegetative propagation, stem sections of 1-2 m length, taken from ageing, high-quality clones are buried in the soil and covered with mulching material, e.g. rice straw. The soil is kept moist to force viable buds on the cuttings to sprout. The plantlets are separated from the stem and nursed in polythene bags for a year before planting out in the field at the beginning of the rainy season. Vegetative propagation by separation rooted suckers from the mother palms is less common. Efforts are also being made in Thailand to raise new plants by tissue culture. The trees start flowering after 5-6 years. Pollination is mainly by insects. The fruit ripens 7-9 month after flowering which keeps taking place throughout the year but the fruits ripen during two months indicating that all the flowers are not able to set fruit. The skin of 10-16 week-old fruitlets is brown, turning darker to almost black at 17-23 weeks, gradually changing to orange when the fruit ripens. The flesh of 10-19 week-old fruits is off-white and turns to light yellow when the fruits are 20-22 weeks old; as the fruit grows it gradually assumes a more yellow-orange colour. The stones in 10-19 week-old fruits are white and contain a jelly-like substance. The colour changes to yellow at 20-23 weeks of age and to brown thereafter while the contents harden. Selection in the rakum palms has given rise to the sala group of cultivars of superior quality. Among them are ‘Sala MOR’ and ‘Sala sane’ ‘Sala Noenwong’ and the spineless’ ‘Sakum’. ‘Sala MOR’ and ‘Sala Sane’ originated from rakum grown near Bangkok. The sala cultivars do not grow as large as the rakum type e.g. leaves of ‘Sala Noenwong’ reach only 3 m this cultivar is further characterized by abundant suckering, long terminal leaflets and the light-brown colour of the fruit, which has an obtuse tip. ‘Sala MOR’ has leaves of about 4m length with shot terminal leaflets and has grayish-orange fruits with a beaked tip. The spineless ‘Sakum’ has leaves nearly as long (5m) as the rakum types and the fruit quality is not much better: there is only a little flesh covering the large stones. Both ‘sakum’ and rakum fruits are greyish orange with a short, pointed tip. In a pure stand weeding is one of the main tasks during the first 1-3 years. A rotary grass cutter or herbicides (Glyphosate) are commonly used to control weeds. In mixed smallholder orchards and home gardens, shading reduces weed problems and hand weeding is practiced. In young non-bearing orchards, removing suckers is the most unpleasant chore, but a must. One or two stems per clump are sufficient for good yield. Dense clumps yield poorly and are difficult to harvest. Leaf pruning is not advisable, but may be necessary to facilitate orchard operations. Irrigation in the dry season, together with application of manure and 3-4 kg per clump of a complete fertilizer with a low N-content improves yield and fruit quality considerably. Hand pollination can also raise yields substantially. Some diseases and pests have been observed, but as the crop is relatively new and minor, the study of the causal organisms and their control has not yet received much attention. Fruit rot sometimes occurs, especially during the rainy season. In rare instances weevils attack the growing point of the palm. A fruit-eating worm is also found. Rodents cause serious loss of fruit. Farmers control the damage by covering the large infructescence with chicken wire. The average yield of rakum palm varies from 6 to 12 t/ha per year depending on cultivars. The fruit must he kept under cool, moist conditions after harvesting to prevent skin desiccation. The post-harvest technology has not yet been developed. Loose packing would be the best way to handle the fruit. There is no commercial processing of rakum so for. Growing sala cultivars of this fruit is turning out to be profitable and there exists a lot of scope for the expansion of rakum cultivation. 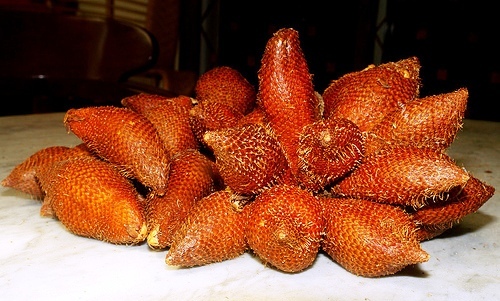 To accomplish this, few problems of this fruit such as making the dense, spiny palms more manageable and to develop post-harvest techniques which will extend the market for this special fruit, need to be solved. This fruit should be promoted in other tropical countries too.